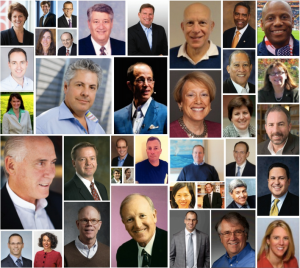 On November 6 and 7, 2014, 98 students and 36 of the most distinguished marketing executives came together for the eighth annual Marketing Executive One-On-One Coaching Program. Hosted by F. Warren Ellish, visiting senior lecturer of marketing and president and CEO of Ellish Marketing Group, the program gives marketing students at Johnson at Cornell University opportunities to network with and be mentored by leading executives in the marketing world. Coaches comprise chief marketing officers, CEOs, executive recruiters, brand consultants, and advertising executives. The event kicked off on Thursday, November 6, with a roundtable discussion, titled “The Role of Marketing Innovation.” Panelists include Jim Goldman, former President and CEO of Godiva Chocolatier; Pat Lafferty, CEO of the creative agency BBH North America; and Vithala Rao, Deane W. Malott Professor of Management and professor of marketing at Johnson. The panel was followed by an evening reception, at which host F. Warren Ellish shared with students the importance of networking and the truly small nature of the marketing world. Each executive was introduced, not by career background, but by the connections they have with colleagues in the room. These connections included college classmates, associates, bosses, mentors, clients, and significant others. The program resumed on Friday, November 7, with 180 individual one-on-one mentoring sessions, by 36 executives, with 98 students. Of the 36 executive coaches, 24 were Cornell University alumni. The event concluded with a luncheon, sponsored by the student-run Marketing Association, where students may network and pose final questions to their executive coaches. This entry was posted by wellish on December 31, 2014 at 5:21 PM, and is filed under Branding, Cornell University, Johnson School at Cornell University, Marketing, MBA mentoring. Follow any responses to this post through RSS 2.0.Responses are currently closed, but you can trackback from your own site.